Depending on the original image data format you might want to setup a different workflow but so far and with DNG Raw files (or other Raw files from a Bayer pattern sesnsor) I believe that Adobe Lightroom creates the best solution to generate clean and artefact-free JPEGs for further processing in UAS specific photogrammetry software packages. Adobe Lightroom comes in two different licensing models (in 2016/2017). One model is a standalone licensing where you pay once and can use the software until your operating system is not supporting this software anymore OR you updated to different digital cameras that are not supported anymore by the (than) outdated LR version. Usually with the next major LR update you just buy the update costs and move on to the next version. This is different with the second licensing mode that Adobe tries to push into the market for nearly all of the software solutions they offer – its called “Creative Cloud” and you basically pay monthly to use the software. Its a subscription based licensing model that ist very interesting for software firms as it ties you to one software solution and revenue ist created on a more predictable (monthly) basis. Lightroom is however one of the few very fast and effective solutions to manage huge amounts of Raw image files and LR doesnt touch the original Raw file – it only demosaics the bayer sensor pattern and saves a description of the processing steps that are planned for the output and visualizes temporarily the result. To create the modified file you have to export the image Raw file to a external file format (Jpeg/Tiff/PSD etc.). 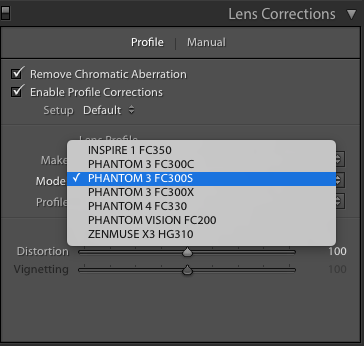 LR also provides lens profiles for most of the common lenses and also covers some copter specific lens designs. Lens profiles correct vignetting, chromatic aberrations and lens distortion. (https://helpx.adobe.com/x-productkb/multi/lens-profile-support.html). Additionally specific CA effects can also be corrected manually. All corrections can be saved as profiles and applied while importing a copter dataset from a flight campaign – you can even export the profiles as ASCII files and edit and reimport later again. LR also manages gradual or localized edits, can be used to remove dust spots, has distortion control, basic panorama stitching and HDR functionality and integrates with online gallery database solution via plugins and exports to other software solutions for better processing f.e. to panorama software (Autopano Pro) or HDR data processing solutions and for other special processing tasks. LR also handles metadata (it doesnt show height within the GPS tag but it exports the height nicely to the JPEG), can be used to create a tagged image database and works with DNG smart previews that allow keeping a full archive in smaller DNG size for mobile editing of thousand of shots of flight campaigns or large photo shootings (see figure below). Fig. : Smart Preview (Mini DNG) icon and Metadata info showing the GPS coordinate. LR wont touch your Raw file, it can write your processing description into an xml file or keep it within a single database file (that is backuped regularly if configured). 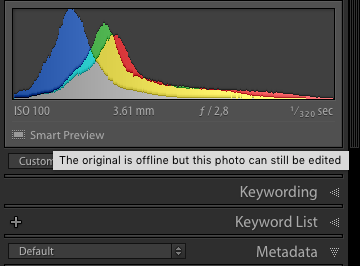 More Info on the LR data base techniques is available on Adobe help pages https://helpx.adobe.com/lightroom/help/create-catalogs.html . stores Metadata, such as ratings and keywords that you apply to photos to help you find or organize them. LR is “non-destructive” – you can always use and work with you unmodified Raw file. 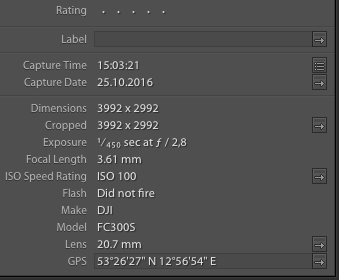 Why should I use Raw files instead of JPEGs that the camera generated? Well its possible to use the in camera generated JPEGs but the acuity and resolution as well as noise control are much better handled when you do the JPEG processing with a dedicated RAW converter. The quality is just a totally different story. 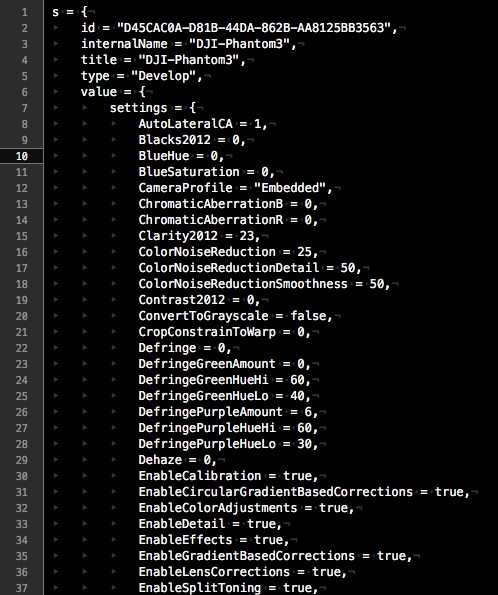 Raw data ist also non-interpolated data. If you ever want to come back to your Raw data archive some years in the future – its likely that you use a much more sophisticated Raw developer software – you will be able to extract more information from the Raw files that you capture NOW. This is also a strategical aspect. Some camera systems are also known to produce very bad JPEGs in-camera. Especially Sony isnt too famous for good JPEG rendering while Nikon usually gets out of a comparison with better grades. While LR doesnt tell you much about the demosaicing algorithm used when you process a Raw file to a JPEG there are some packages online that are much more transparent when it comes to demosaicing the bayer pattern: namely “RawTherapy” is very interesting here: http://rawtherapee.com/blog/features but it lacks the integrated (does it all) capabilities and the databased linkage. Alternatives to LR are: Phase One Capture One Pro and DxO Optics Pro. Unfortunately the real competitor “Aperture” isnt any longer maintained by Apple. Aperture was a serious alternative to Lightroom – “Fotos” the follow up App from Apple isnt a professional batch environment for processing images anymore. Camera specific Raw import software comes f.e. from Nikon (Capture NX/ViewNX) or Canon but it lacks the integrated database connection and is usually much slower processing large amounts of Raw files. LR-export to adjusted uncompressed 8 Bit JPEGs (or 16 Bit TIFs – usually JPEGs will be enough), hundreds of 16Bit TIFs quickly demonstrate how small you hard disc system is in reality. Multispectral/Point Cloud data processing in Trimble OBIA software “eCognition” and/or PCI Geomatica (specialized commercial Earth observation software packages). Point Cloud visualization QTerrainReader or Autodesk ReCap can do that nicely. Fig. : LAStools bast2dem that imports and works on a las/laz point cloud and rasters a dem file. Fig. 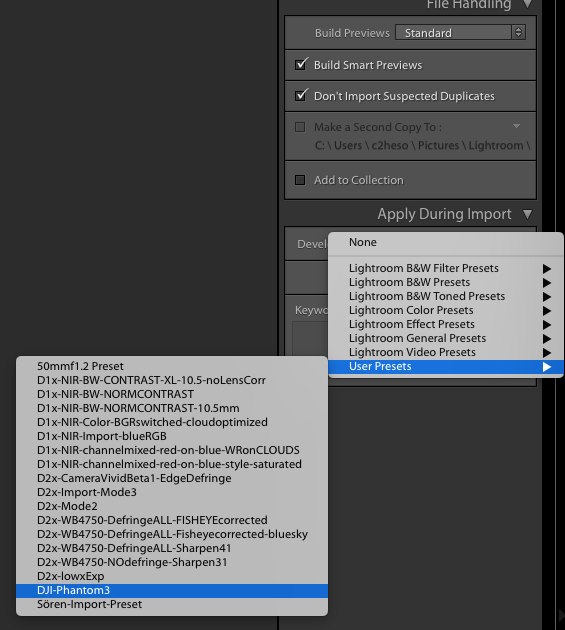 : Lightroom Profiles (Presets) to batch-transform image files – can be integrated into the Raw file-import function easily. 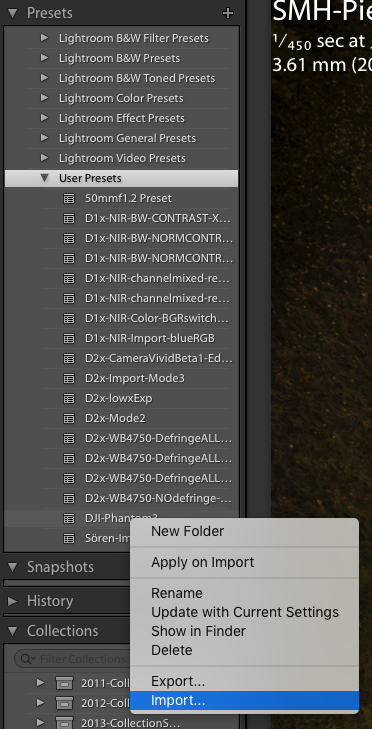 Highlighted here is the preset import function.